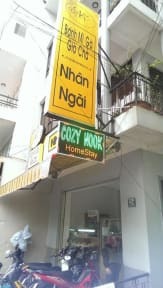 Cozy Nook Hostel i Da Lat, Vietnam : Boka nu! They have this japanese toilet with an inbuilt bumgun and bumdryer! The shower is literally like back home with The best pressure and hot water! The beds are comfy but The pillow is a little bit to Hard, but thats my opinion! The staff was superfriendly and gave us some snacks when we checked out! And The breakfast included in The price was amazing with homemade jam and homemade juice! Best hostel I’ve ever stayed at! So clean and the staff were so kind and helpful. It felt like we were home again! If you’re going to Da Lat you have to stay here, it was easy to meet people as well and the breakfast included and really nice! The staff at this hostel is spectacular, they will help you with everything you need help with. Great breakfast! And the family dinner is out of this world, different food every day, and during the 3 nights I stayed, it was packed at dinner. Very easy to meet new people. Would recommend, and would def stay again. Best hostel I’ve stayed during my SE Asia trip!! Highly recommend it! Väldigt väl fungerande hostel med trevliga gemensamma middagar! It is just like almost all the reviews says. IT IS AMAZING AND I F LOVED THIS PLACE! Lovely family dinner and amazing just aaaammaaazing staff! Helped me right away and made me feel at home and they were super nice. It is one of my 3 top best hostels I stayed at SE Asia and the world! Thank you for that lovely private classical music performance after dinner. Amazing! STAY HERE WHEN IN DALAT! One of the main reasons why we booked this hostel in the first place was because of the insanely good reviews and I can happily say that we extended our stay there a couple more days because of their amazing hospitality and great care for the people staying there. We arrived at 4 in the morning and were offered blankets so we could sleep in the lobby untill they had a room ready for us. Really nice big showers and their breakfasts are great as well, not to forget the daily family dinners! The family was super friendly and made sure we had a really nice stay. I am gluten intolerant but they were really adaptable and gave me extra fruit, egg and yoghurt for breakfast instead of bread. Dorms and toilets were always clean and beds were comfy. Great atmosphere! Literally one of the best hostels I've ever stayed at! Felt like a home away from home. Great atmosphere, super friendly staff and lots of opportunity to meet fellow travellers. The nightly family dinners are a definate must-do, and the breakfast is fantastic! The dorms are clean and cozy (and the en suite bathroom... wow) Also, the wifi was really fast.